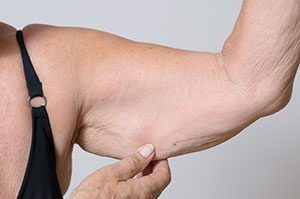 An arm lift may be appropriate if you have loose or hanging skin and excess fat in the upper arms despite toning exercises, or if you have lost a significant amount of weight. Incisions hidden in the axilla (underarm) or incisions along the inner arm are necessary to tighten and reshape the upper arm. If skin tone is good, liposuction alone may reshape the arm by removing excess fat. Generally, this is done as a day-case under general anesthesia. Recovery depends on the extent of your arm lift and any accompanying procedures. Light activity can be done the day after your surgery and a full return to normal activities may take 1-2 weeks. Light compression garments may be recommended during your recovery to help reduce fluid retention and shape your trimmer arms. Results can be long-term, but as per some of the other liposuction procedures weight loss/gain or natural aging may alter your appearance.